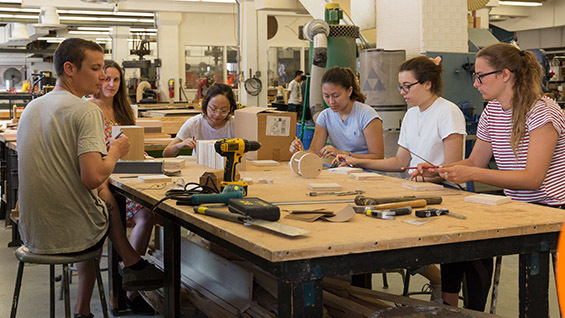 The students, faculty, and staff of The Cooper Union rely on the assistance of a group of largely unsung experts: lab, studio, and shop technicians. Students benefit from the knowledge and talent of the Cooper faculty as well as the technicians’ hands-on guidance in the fields of printing, woodworking, laser cutting, tooling, film, sound, video, photography, computing, casting, and a variety of other skills. Their expertise is not a surprise considering that many of Cooper’s techs are highly gifted artists in their own right. We sat down with four of them who are practicing artists to talk about their work both inside and outside The Cooper Union. Adams’ artwork explores multiple patterns and materials so they frequently have a tactile quality. 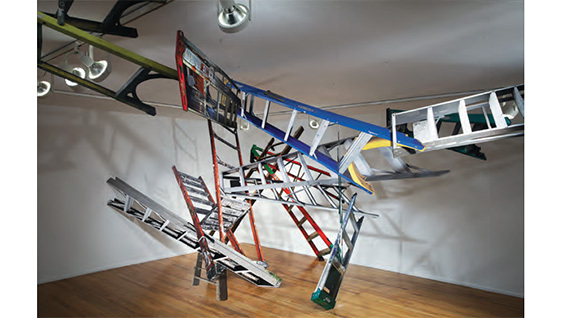 One of his exhibitions, Wayne Adams Is Speaking in Tongues: A Show of Objects and Images Organized by the Unrelenting Voice of Interpretation, includes, among many other pieces, four large canvases that are part of his Rift series—fake fur of varying colors divided by a precisely placed triangle of paint. At the room’s center is a wooden sculpture on wheels vaguely reminiscent of R2D2 in shape. It depicts Jesus sitting on top of a Thomas Kinkade blanket. Zach Poff, adjunct professor and technical assistant in film/video, finds exhibiting students’ work for the End of Year Show “bittersweet.” On the one hand, he wants to showcase the work of the students who took Projects in Sound Art, a course he’s taught since 2007. 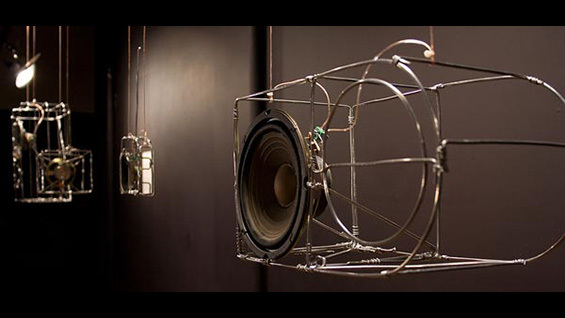 On the other hand, sound art often needs particular environments, ones that sometimes require greater space or context. “Many of the projects were created as installations,” he says. “They’re very difficult to include in a group show.” In a culture so geared toward the visual, finding literal and psychic space to listen is a central challenge to making sound art. Poff himself was initially studying photography and 16 mm filmmaking as a student at an arts high school in Baltimore. Poff’s The Sound of The Sound of Music builds on that idea by taking a “common text”—the 1961 film version of the Rodgers and Hammerstein musical—and rearranging it based on pitch, not narrative. Similarly, for Video Silence, he wrote custom software to record very quiet moments from television shows. The program strings together a one-minute clip that is played on a loop until the system has culled another minute’s worth of quiet. Both pieces function as scaffolds that, as Poff puts it, “the world pours itself into.” This last point is critical to Poff, who is less interested in creating an artwork that is complete or self-contained than in making a new way to see and hear what already exists. He finds that older technologies often have a mythology attached to them. Trains, for instance, are greatly romanticized with myriad associated stories that he views as material for his art practice. 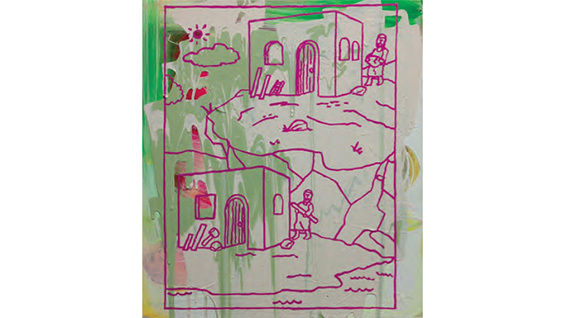 His work “teases anecdotes out of stories and toward material form,” as he puts it. 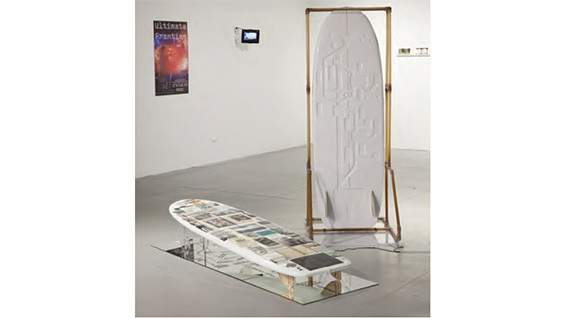 He finds that these artifacts—both physical and conceptual—sometimes resonate with current political and cultural circumstances. In 2012, he and Audrey Snyder A’13 designed a rail-riding bicycle that they used to ride abandoned train tracks around the country. Their research led to an exhibition and book entitled Parallel Cases. In a recent interview, Jennifer Williams A’94 stated matter of factly, “No one knows what photography is anymore.” She is not throwing a polemical bomb; she is making a statement of fact, gleaned from her work as co-head technician and adjunct professor of photography. While the objectivity of photography has been called into question for years by artists and historians alike, Williams’ work addresses the medium’s unreliability in a particularly physical way: her collages of buildings are often large and arranged in a way that makes them seem three-dimensional. Structures about structures, they are at once a tromp l’oeil of the brick-and-mortar real thing and a wild rendition of street life, as if a detonated bomb had upended and rearranged the scene. The vividness of the collages is furthered by their very careful placement. A set of her collages was installed at the Queens Museum in the room with the famous model of every building in New York City that was created for the 1964 World’s Fair and updated every ten years. Her show, New York: City of Tomorrow, includes collages of new skyscrapers extending out from islands of smaller buildings. They appear to be tethered to an older New York but hardly of it. As a technician and instructor at Cooper, she’s noticed a sea change over this past year: “Now first-year students know nothing about film and film cameras. Film did so much work for you.” She explains that different film brands and speeds had different qualities—Kodak Portra 400, say, for accurate rendering of skin tone, or Fuji Reala 100 for its fine grain, low contrast, and high saturation. Today, photographers shoot digitally and then process later to get the desired effects, an added step not needed with the right film. As a resident of the Lower East Side for more than 20 years, Williams witnessed an enormous transformation of the neighborhood. She keeps a blog of photographs of the apartment where she lived, which, like her other work, is a form of analyzing space but on a smaller, more personal scale.